Earlier this month, United sent me an email saying they had a sale to a few destinations out of Houston, TX (IAH). One other reason to subscribe to the emails from airlines. I checked around and saw that I could get a $211.00 fare from Houston to New York-LaGuardia, so I booked it right away as I needed to attend a conference and also see some friends as well. 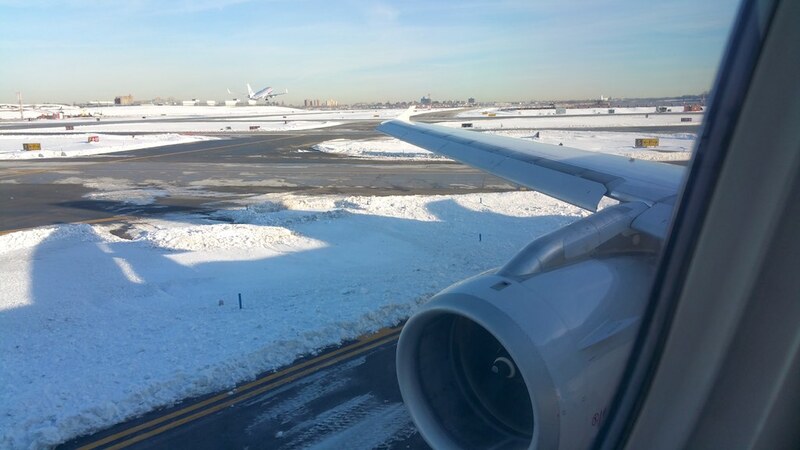 The afternoon before the flight, I realized that I wanted to change to an earlier flight, which due to my Premier Gold Elite status, I was able to change with ease and at no charge. I could do this on their Web site as well as on the mobile App. I opted for the iPad version of the mobile App. I did notice that there were two open seats in First Class and that to would cost me $199 to pay for an upgrade if I wished and there was also two persons on the First Class Upgrade Standby list and I was the first one. Great I stood a good chance unless some other elites with better status were also on the flight or two people bought those seats. Let’s see what happens. I was up at 5:25a, even before my alarm went off. I wanted to get an early start as it would be a long day. 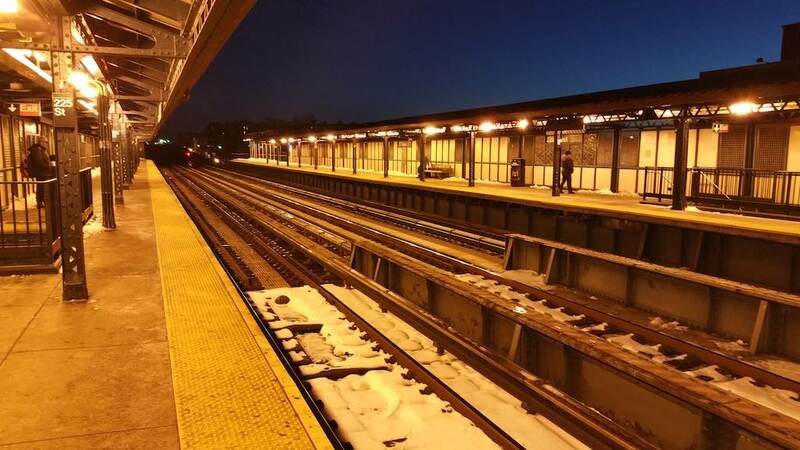 I felt like I was alone on the streets, but by the time I got on the bus and the subway that changed somewhat although the platform seemed like a ghost town. 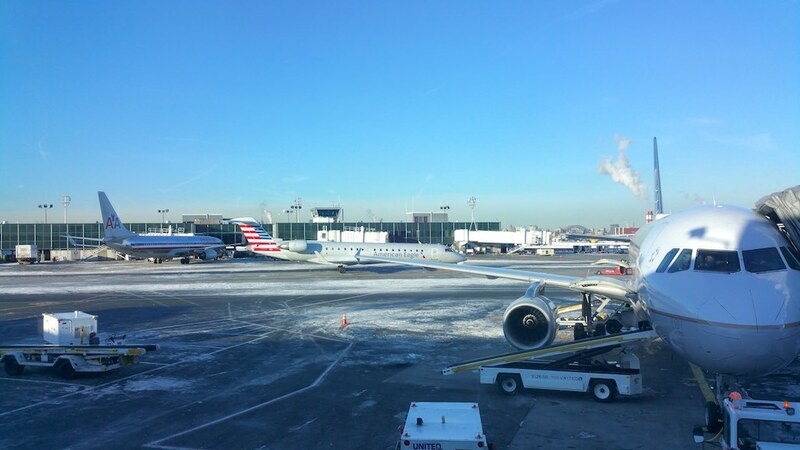 After navigating the New York City Transportation system, I arrived at the airport at 7:45a and stupidly got off the bus at the Delta Air Lines Terminal. I’m not sure why I did that as I’ve taken this M60 many times. Anyways, I then made my way to the Central Terminal C Concourse after a 10 minute walk in the frigid weather. Maybe its ’cause LaGuardia Airport has more than one Terminal C; I mean really. other airports such as say Houston has Terminals A-D and yes they are housed in different buildings. It’s perhaps time LaGuardia re-lettered it all and while they are at it, try to connect the Terminals too on the air side. Actually, I’d just be happy to connect them on the non-air side, but I digress. Once I made it to the Central Terminal (yup, the sign actually says that) I then checked in again at the kiosk just in front of the Premier Access area. I was playing around with the machine and noticed that it offered me connecting options for flights tomorrow a.m.; intriguing I thought :). I could even do connecting flights. You can read all the rules here at your leisure. I declined any more changes as I did not find any other that would suit my needs and settled on my 8;45a departure. I then printed my boarding pass and a receipt and headed for the United Club, just around the corner and up the stairs. Oh, the cool thing is that as a Premier Gold member, I could change my flight adnauseum all day long at no extra charge as long there’s a seat available. Loyalty does have its privileges. The agents I’ve encountered here at the Club are always pleasant; they greeted me and ushered me in just using my boarding pass since it contained my MileagePlus number which is associated with my Club membership.. For the United Club, you can either be a member via many methods (I’m a member due to my Presidential Plus credit card) or gain access when traveling internationally by being a Premier Gold or above member. Premier Gold members are Star Alliance Gold members who have access to the Lounges as long as they have a same day international boarding pass. It was looking good for the complimentary elite upgrade, so I did not get anything for breakfast. I had a choice of bagels, donut holes, cereal, fruits (bananas or apples) and tea or coffee. I got to the gate and noticed that I was upgraded to 1F as shown on the monitor near the gate. I stood by the podium waiting to pull up my boarding pass and the agent asked me if I was Mr. McKenzie. I told here yes, she said she had paged me and then handed me a boarding pass advising that she did not want me to wait any longer for the upgrade since they had two open seats. I thanked her, scanned my boarding pass and boarded. I greeted the crew onboard and settled into my window bulkhead seat. I’m not usually a fan of this seat as I can’t stretch out my legs fully and I have to put my bag in the overhead. But I was just happy for the upgrade, so I sucked it up and put my bag in the overhead bin just above my seat. Seat 1E was still empty. United gives a blanket in First class on domestic flights or in all cabins if the flight is a red eye flight. Blankets are not distributed on domestic flights. I was asked if I wanted something to drink by the flight attendant to which I answered, tea with lemon please. I was also asked if I’d like my jacket to be hanged and I indicated yes and thank you. My hot tea arrived soon after and was very welcome due to the very cold weather. Later, the flight attendant came by and asked me my name and if I upgraded at the last minute. I spelt it for her and also said yes about the upgrade. So my guess is that the final report was not printed since I got upgraded. She then wrote my name down and went across the aisle and called the other passenger by name and asked her what she wanted for breakfast. She quizzed the almost the entire cabin, then came back to me. I had a choice of an omelet or cheerios, I chose the omelet and added that I’ll have some tea with lemon. It was not until 9:24a though that we left the ground bound for Houston. The air traffic was just terrible this morning. 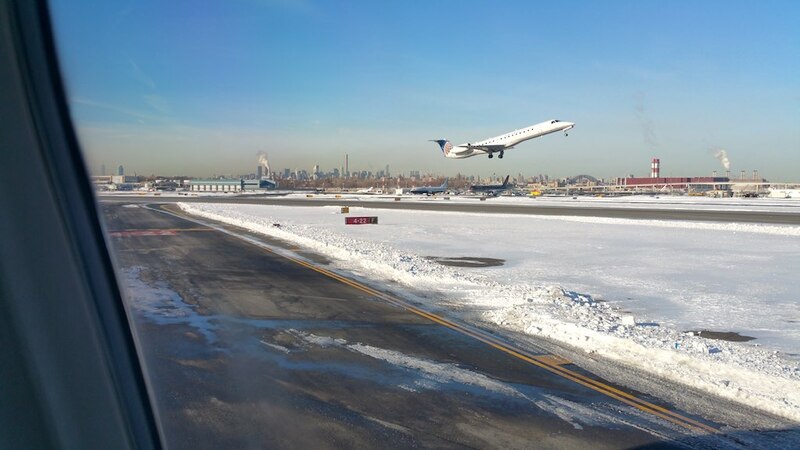 I did not mind though as I had a chance to take some photos of the Manhattan skyline and the departing airplanes. Plus Donald Trump’s Boeing 757 with winglets was parked near the Marine Air Terminal. 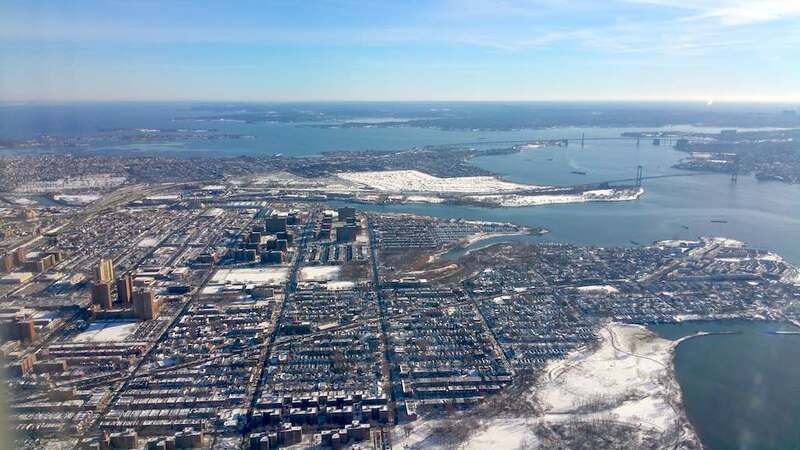 Once cleared, we were airborne in a snap climbing into the cold air above Queens and Manhattan. I tried to stay awake after takeoff, but kept dosing off. As soon as we leveled off, the flight attendant started her work in the galley. The service started with a hot towel. 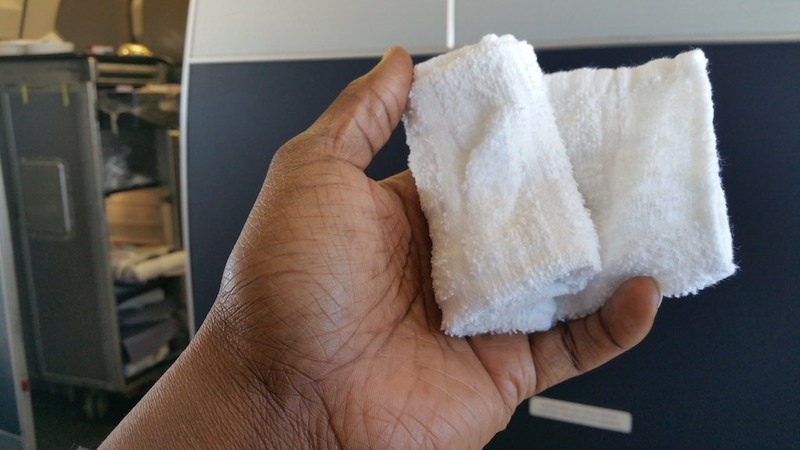 It’s sometimes hit and miss with these towels depending on where the one you got was in the tray. Basically, the towels are placed on a tray and hot water poured on them. So if you get one that had a good helping of water, you are good otherwise… I was in the otherwise category today so mine was not thoroughly wet. When you’ve flown First/Business Class a few times you know what to expect. Breakfast may include a Southwestern Houston Skillet entree with cage-free scrambled eggs, pepper jack cheese, sauteed pepper mix, sliced New Mexico sausage, potato gratin and fire-roasted pepper sauce served with fresh fruit and warmed biscuits or croissants. 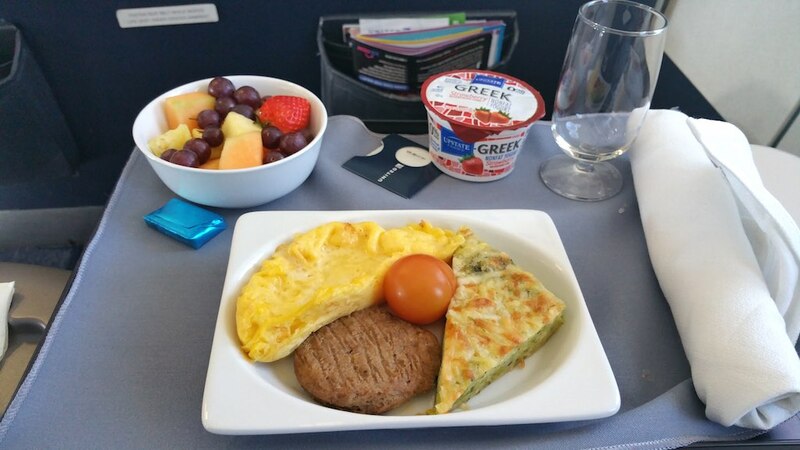 You can read more about all the dining options for domestic flights here. The meal was actually quite good; the croissant or cinnamon roll choice followed shortly after the delivery of the meal. 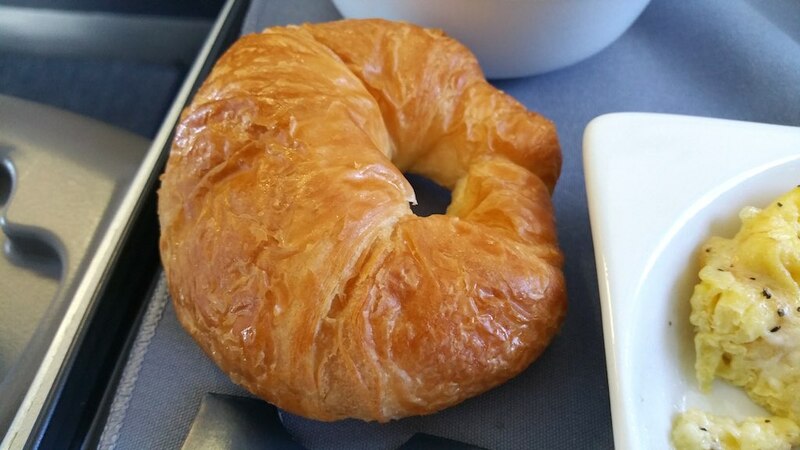 I opted for the croissant and was delighted. This meal is really the arrival BusinessFirst breakfast on the flights to Europe, but with a little less fanfare. The flight attendant was actually quite pleasant and did a good job with the service. She was quite attentive and cleared the trays rather efficiently. She asked if I wanted anything else, so I had some Baileys on the rocks. 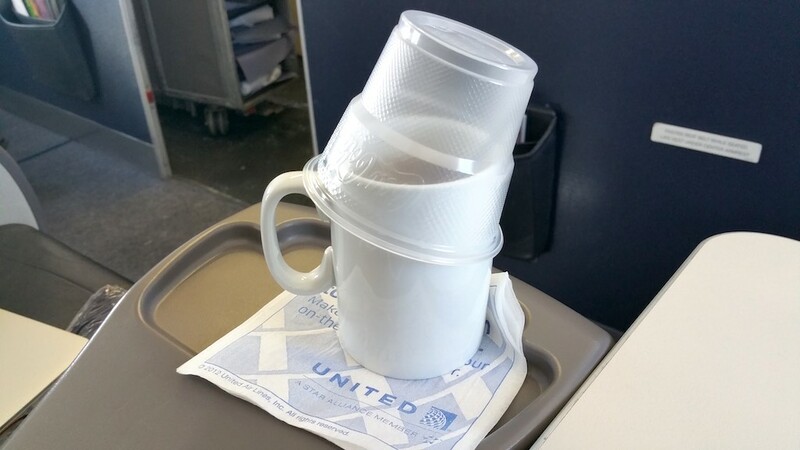 Another flight attendant delivered this while she cleared more tables. This particular aircraft is equipped with Wifi. 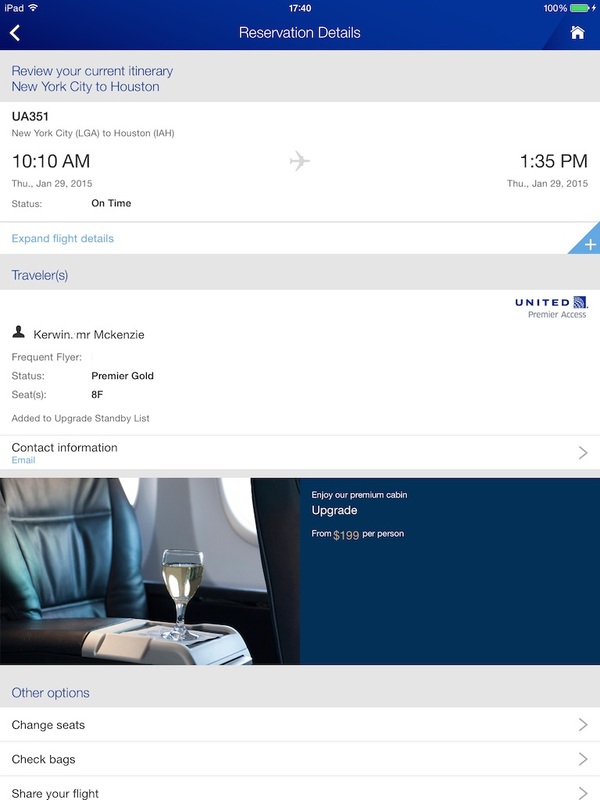 Now on United they have different vendors providing the service so the offerings are quite different depending on the airplane you’re flying and the duration of your trip. This was the service that had $8.99, plus you had a host of complimentary movies to watch, courtesy of the Chase Explorer credit card. 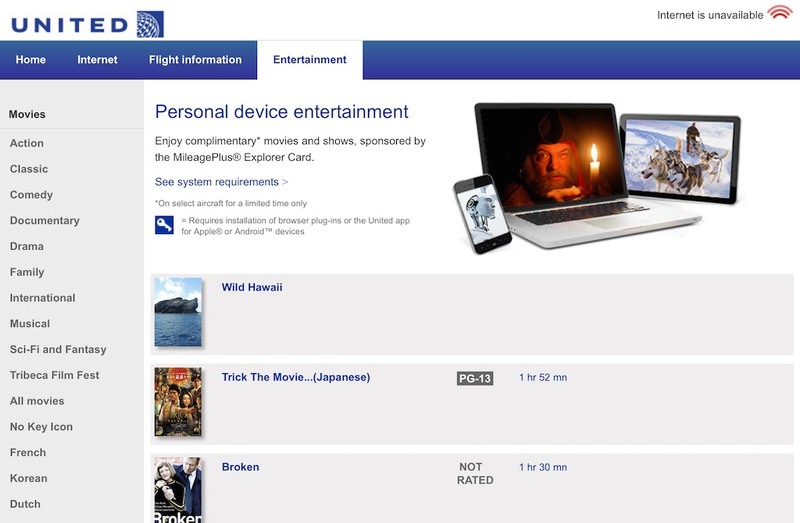 There are some flights where it cost $1.99 for email access and $3.99 for Internet and you may or may not have free movies to watch on your mobile device or computer. In all cases, you don’t have to pay for Wifi to watch the free movies. 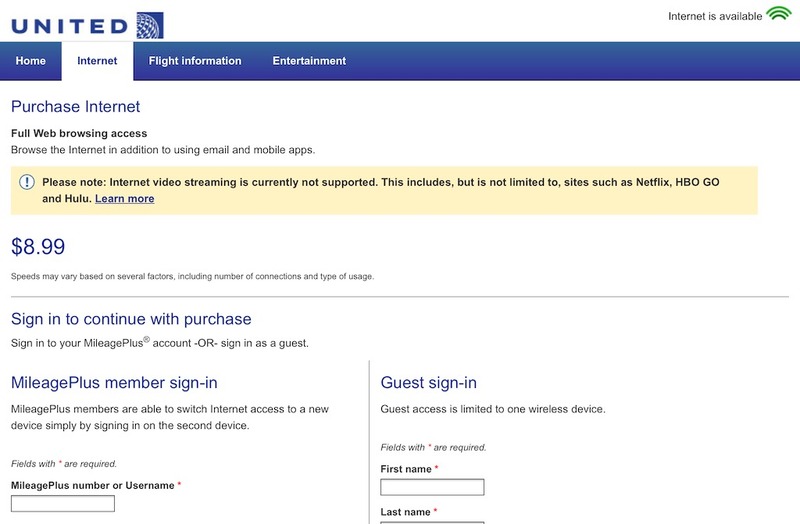 I’ve also flown a flight where all I had was movies available on my device; no Internet. It’s hard to keep track, but when Wifi is available, you’ll see a Wifi icon on the side of the plane as you board or if you use the mobile App, you will see the Wifi logo when you check the flight status. In all cases, you won’t know how you’ll pay until you are at 10,000′ and the system is activated. I decided against activating the Wifi on this flight as its too short for the cost and as I’d woken up so early, I knew I’d not be awake for much. Plus, there was nothing pressing that I needed to do today. I did peruse and watch some of the entertainment choices though using my my iPad as well as listened to a podcast, before falling asleep while sipping my Baileys. A fun way to pass the time on a flight. 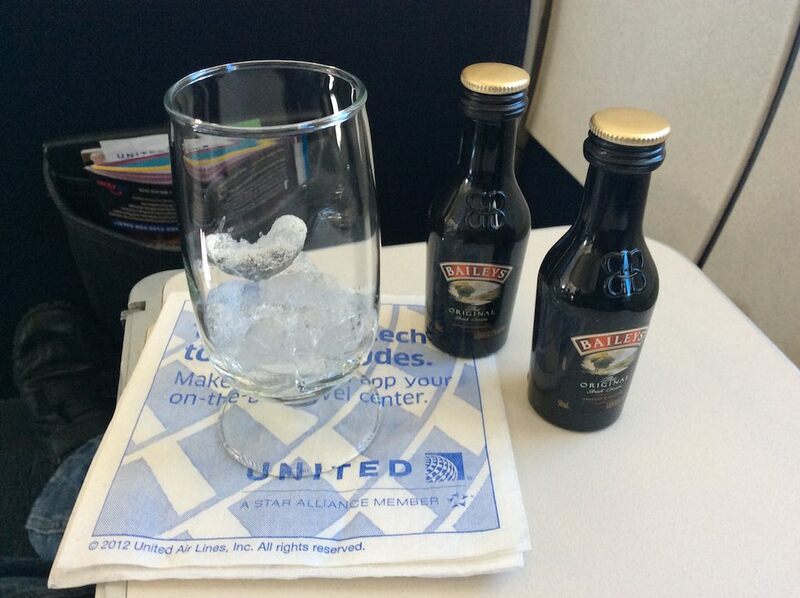 I awoke later to a bit of turbulence only to find a fresh glass of ice and more Baileys waiting; how cool is that? Soon, it was time to land in Houston so time to clear up all the inflight goodies, stow that chair table and bring the seat upright. A good flight all in all. We ended up pulling into the gate at 11:41a twenty-five minutes earlier than scheduled at 12:07a. 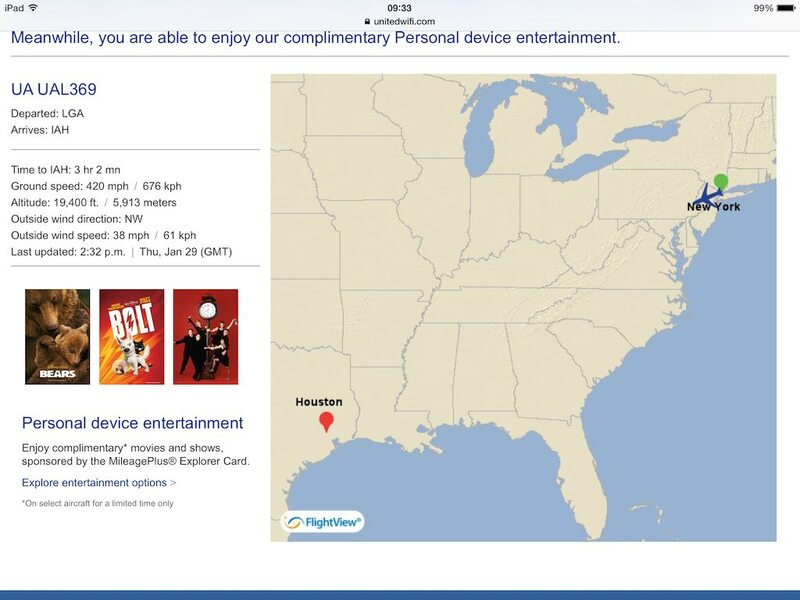 All the time I could use the Flight Information portion of the entertainment system to track my position. 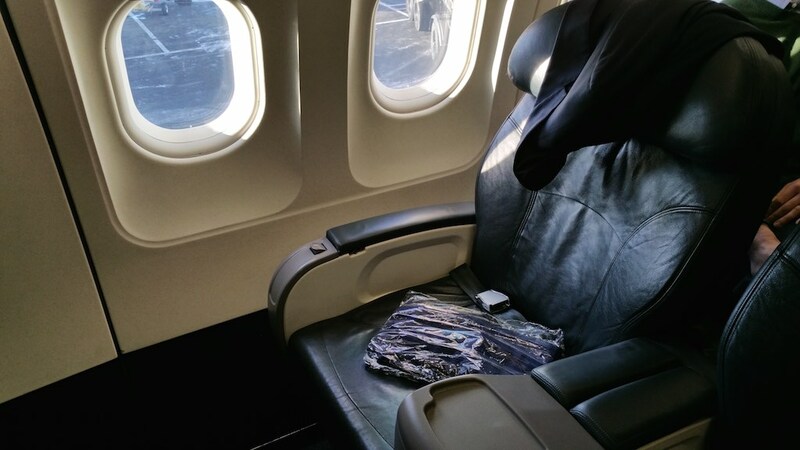 Have you enjoyed United’s First class service on a domestic U.S. flight? Leave a comment below and let me know. Or maybe you want to find out how you too can attain airline Elite status and be eligible to be upgraded on a flight. Drop me a line here. What an impressive review. Seems like you have the whole upgrade thingy sussed Kerwin – definitely need to gleen a few tips for long haul flights. Its all about loyalty and being flexible and sometimes just lucky :-). That route can be bad with more than 20 elite flyers on the standby list. Just let me know and I’ll give you some tips when you are ready.